As I still have a good amount of last week’s bake left in the fridge, I wanted to bake something that we could eat for pudding this week so I chose Mary Berry’s classic apple pie recipe. I picked out several lovely apples in Morrisons while doing my weekly shop, and had the rest of the ingredients already. The only variation to the recipe was that Mary adds cloves to hers and we are not keen so I sprinkled some cinnamon on the apples. 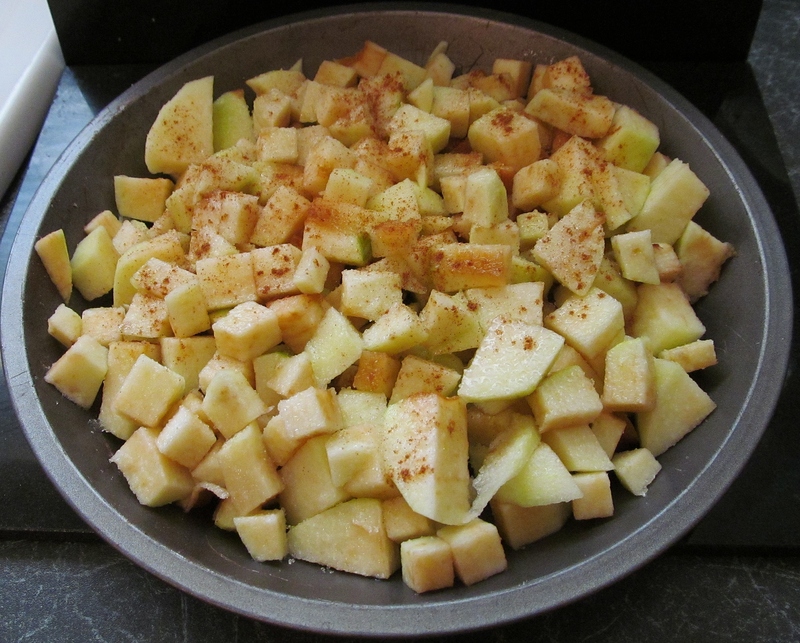 I cut the apples, sprinkled the sugar and cinnamon, added the water and rolled my pastry. Then I needed to decorate it in some way. For Christmas I got a roller that creates lattice work so I decided to try that- what a bad move!!! When it works it looks great but it sure isn’t as easy as it looks!!! I rolled and cut the lattice work and laid it on the top at least 6 times and took it off and re-rolled it until I was happier with it! I guess it will be easier with practice!!! 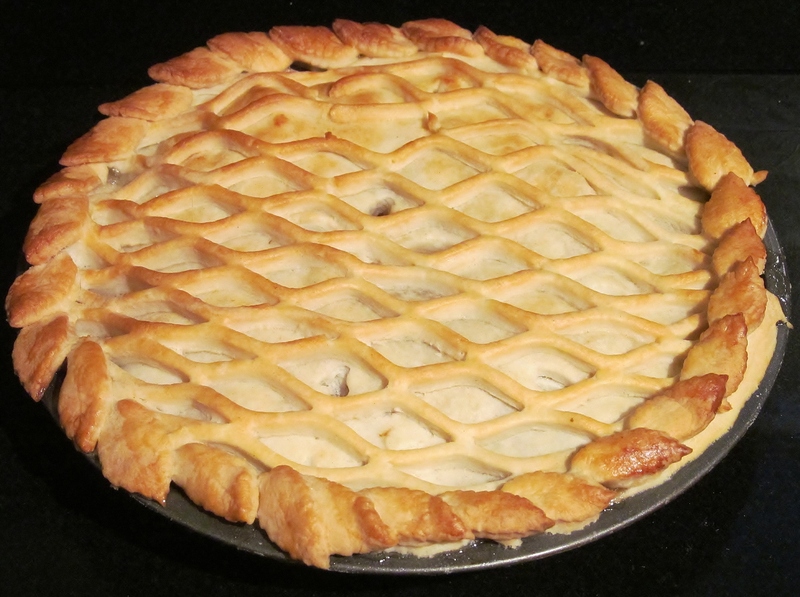 I then used a leaf cutter to cut out some leaves to make the border and finish the pie. I am happy with the way it looked and baked and hopefully when we eat some later with a little cream, it will taste as good as it looks!!!! I have also looked through Mary’s book and realised how many more recipes I have yet to do so will try when possible to double up on a few more! 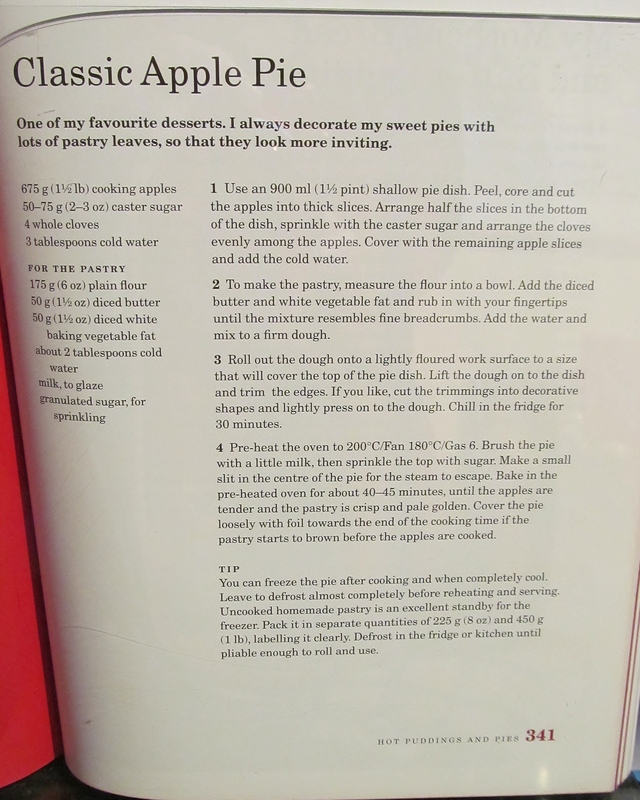 This entry was posted in Kim's cake challenge and tagged Apple, Apple pie, Baking and Confections, Cooking, Fruits and Vegetables, Home, Kim's Cake Challenge, Mary Berry, mary Berry's Classic Apple Pie, pie, Pies and Pastry by kimsideas. Bookmark the permalink.